Luton striker Jake Jervis has been backed to make a real impact at Kenilworth Road by new arrival Sonny Bradley. The centre half, who signed from Plymouth recently, has been reunited with Jervis for a third time in his career, with the duo having played at Argyle and also Portsmouth. It’s been difficult for him, but Jake’s a great pro, a good lad. 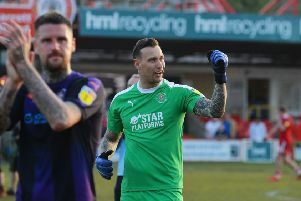 Since joining the Hatters, the 26-year-old forward has seen limited game time, making just 10 appearances with two starts and is yet to score either, but when asked if he could be a hit, Bradley said: “I don’t see why not. “Obviously it’s difficult at the minute as if you look at the squad and look who’s starting it’s hard, especially with Hylts (Danny Hylton) and (James) Collins. “It’s hard to keep them out of the side as they put a lot of work in and are really good goalscorers. “So it’s been difficult for him, but Jake’s a great pro, a good lad.